What does it take to make a difference in the world? Power and money? That’s the answer many people will give, and too often it seems to be true. But there’s at least one couple in Mercer County who has a different answer: It takes your personal desire and energy, combined with the practice of listening to and learning from others in the spirit of community. Nice ideas, but do they reflect the speakers’ lives? Yes, actually they do. 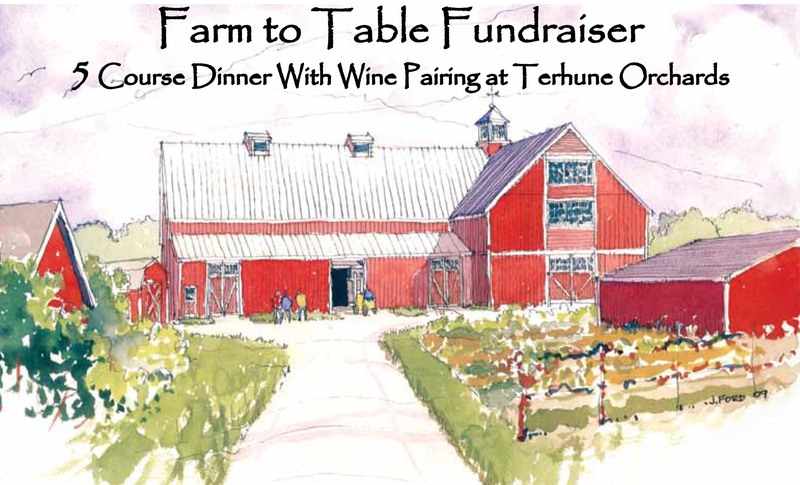 Pam and Gary Mount, owners-operators of Terhune Orchards, are celebrating the farm’s 40th anniversary this year and hosting the fourth annual Farm to Table Dinner, Thursday, July 23, in the farm’s historic 160-year-old barn. The affair is a “fun(d)raiser” for the green teams and organizations in the Mercer County Sustainability Coalition. The five-course dinner with wine pairings celebrates the local food movement and features ingredients from the Terhune farm and vineyard and other local farms. The meal will be prepared and presented by local chefs from the Terra Momo restaurant group and the Bent Spoon. Other farm events taking place over the next couple of months include summer camps, read & pick activities, canning and freezing classes, the Just Peachy festival, and Sangria weekends. Pam’s desire to contribute to a better planet goes back to 1967, the year that she and Gary joined the Peace Corps and traveled to Micronesia, a group of islands about 3,200 miles west-southwest of Hawaii. Pam was especially impressed with the island of Satawal. There she taught English to school children and also helped develop a teacher training program. “I learned as much from the islanders as they did from me,” she says. “The American style of competition was not the way things were done. The students helped each other, and they all learned quickly. Everything on Satawal was done communally. Everyone helped everyone,” she says. Upon returning to the U.S., the Mounts lived briefly in Bucks County, and eventually managed to borrow enough money to buy the Terhune property and begin their lives as farmers. Among other things, Pam focused on running and expanding the farm store, planning farm events, and being mom to three kids, Tannwen, Reuwai, and Mark. Beyond the farm, Pam has been an active volunteer for land preservation and cultural and historic causes. She has served on the Lawrence Township Council and served as mayor in 2001, 2005, and 2009. Today Pam continues her community efforts in many ways, including her role as a trustee for the 2015 Sustainable Jersey program. Since 1975 the Mounts have evolved and grown the farm from 55 acres of apples, peaches, and pears to 200 acres and more than 40 crops including fruits, vegetables, berries, and flowers. Many of the crops are organically grown. The farm property includes two barns, a green house, a bakery, a farm store, and a winery and wine tasting room. Visitors can buy produce from the store or pick their own based on seasonal schedules. The Mounts’ daughters, Tannwen and Reuwai, and their spouses are actively involved in the farm. After six years of living in San Francisco, Tannwen felt the call of the family farm and moved back east in about 2004. Having toured several vineyards in California, she brought her enthusiasm for wine making back with her and enlisted dad Gary’s help in planting grapes for their soon-to-be winery. Today visitors can purchase 12 varieties of Terhune Orchards wine at their farm store and the tasting room in the farm’s historic barn. Reuwai returned to the farm this year after several years of teaching in countries across the world and heading the science department at the Lawrenceville School. Making use of her science background, Reuwai focuses her energy on organic farming and water conservation. Learn more about the July 23 Farm to Table Fun(d)raiser on our Farm to Table page. We hope to see you there! Reprinted from the July 8, 2015, issue of U.S. 1 Newspaper with the permission of the author, Lynn Robbins.